Over 60 people, including many Borough Councillors, viewed ‘An Inconvenient Truth’, Al Gore’s Oscar winning film about climate change at the Friends Meeting House in Darlington on Wednesday 5th March. This successful event, organised by Darlington Friends of the Earth, was followed by a discussion with a panel of local councillors representing the Conservative, Labour and Liberal Democrat parties supported by council officials. Darlington Cycling Campaign was also present. The consensus of the meeting was that on such an important issue, all politicians should pull together to use their influence to pursue policies to improve the environment and halt climate change. Several people present called on local councillors to set an example and lead from the front. Darlington Friends of the Earth Coordinator, Kendra Ullyart, told the meeting that the group and its members will continue to pressure for change. She said ‘that in addition to our national campaign for a strong climate change law to reduce carbon emissions by 80% by 2050; we will also be concentrating on local issues, and campaigning to get robust recycling policies in place throughout the area’, She then invited the audience to continue their interest in the environment and join the group. The next meeting of Darlington Friends of the Earth will be held on Monday 10th March at 7.30 pm where members will have the opportunity to quiz Ian Thompson, the Borough Council’s Assistant Director of Environmental Services, about waste management policy and practice. How politicians lead from the front – in Germany! Dr. Reinhard Loske, Environment Senator, Bremen. At the Association of Parish Councillors (where all parish councillors from across the area can meet) on Thursday night, another parish councillor mentioned this. I too would like to see this film, now that I understand a little more of what it is about. I’ll be looking out for the details of when it’s planned to be screened. I wonder; who lets who know, when the meetings of the friends of the earth takes place? To be honest I’d never heard of the Friends Meeting House until Cllr. Mike Barker mentioned it on his blog. I also intend on visiting the gardens to the rear of the building. It’s remarkable, isn’t it? Darlington – the Quaker town – the local football team called The Quakers, yet the Quakers themselves nearly invisible to the general public. As for the equally invisible Friends of the Earth, I think you’ve hit a major problem in Darlington, Mark. There are a myriad of groups and organisations in the town doing great work that are made invisible by one single fact – the lack of a genuinely inclusive “What’s On”. The council will only promote their own stuff, and the local press only respond to press releases, so only organisations with PR resources get in. Just ask yourself “where are the art exhibitions in Darlington”? The truth is, all over the place (eg Darlington has a photography gallery), but the lack of a What’s On makes it difficult to find. The Quakers and Friends of the Earth suffer from this same lack. Mark, I’m going to try to arrange a showing at St Andrew’s church in Haughton; I’ll let you know if/where/when. I wonder if there’s a place for a web-based What’s On In Darlo. A site that collates Darlington-based blog posts, and events and groups and links them all together in one place? A community site, like DarlingtonTown has the beginnings of, but doesn’t quite deliver. Mark, do you know who runs the site now? 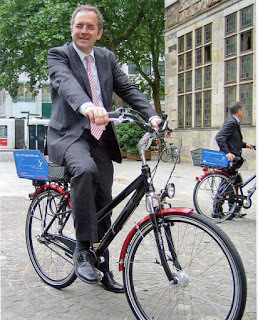 Not in English, sorry, but it is about free business bikes for short business trips (3 – 4 miles one way). These distances cover the whole of Darlington: Yes, that is CHANGE, WE CAN BELIEVE IN. Hi Mike & An Inconvenient Truth, the DarlingtonTown website is run by my friend Dave, I’m sure he would be very interested in helping to collate Darlington-based blog posts, and events and groups and linking them all together in one place… I’ll talk to him today.